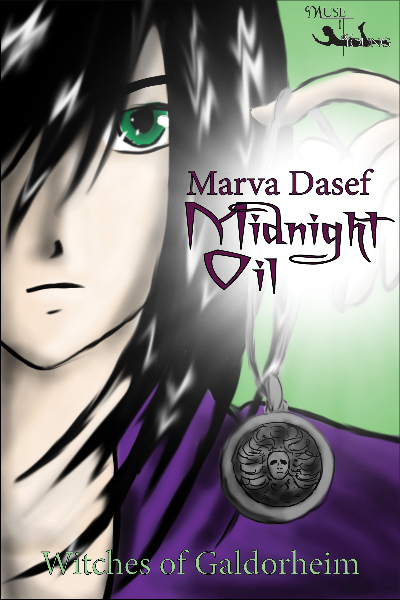 It’s my pleasure to welcome Marva Dasef back to tell us more about her intriguing series about the Witches of Galdorheim. I enjoyed the first book, Bad Spelling. You can see my review of it on Amazon. Now Marva will tell us about two more books in the series. Hey, Marva, love your hat. Leave a comment, with your contact information, on this post for a chance to win a free ebook. You will recognize the familiar style of Kaytalin Platt’s cover illustration as being similar to that of Bad Spelling. First off, thanks for having me on your blog today, Barbara. Just like the good old days of last September when we participated in that crazy MG/YA Blogathon. Well, this is a bit quieter since I’m just running around from blog to blog telling people about my new book release, Midnight Oil. You asked me about traveling to the places where my books are set. I’m afraid that I haven’t yet gone to the Arctic, Norway, Finland, or Siberia, but that’s certainly on my bucket list. I’m particularly interested in Norway because my grandmother was born in Trondheim and came to the US when she was sixteen years old. What an adventure for a young girl to have! Mostly, though, I rely on the internet and atlases to give me an idea of what an area is like. It certainly has piqued my interest in travel. I wish I could visit the magical part of the real world. Being mundane, however, I don’t think I’ll make it to Atlantis or the Hall of the Mountain King (the troll kingdom). It’s fun for me as a writer to mesh the real world with the magical world of the imagination. I’ve always been a huge fantasy and science fiction reader. I like my fantasy with tongue-in-cheek humor. The great epic fantasies don’t appeal to me. In know, I’m a heretic since I didn’t like the Lord of the Rings as a book, however, I loved the movies. I can’t even remember all the old time authors I read growing up. What I do know is that if it doesn’t have more than a little comedy, my attention wanders. I’ll thoroughly enjoy a children’s’ book like the “How to Train Your Dragon” series, but can’t get into Twilight or the Hunger Games. I guess I’m more kid than adult in my reading tastes. I do read more MG/YA fantasy since it’s my primary writing genre. You asked what my favorite is. I’ll go with Fall. Indian summers are the best. Frost on the grass in the morning, and the sun beating down on you in the afternoon. Well, that’s the Pacific Northwest version. Your own geographical region may vary. I would like to say a word or two about series. My advice to writers is to make each book stand on its own legs. I hate being left in the middle of a story with the expectation I’ll be dying to read the next book. I want the question in my mind, “What happens next?” But I hate being forced to read to find out. Write a complete story for each book in a series. Leave the cliffhangers for the ends of chapters. Which leads me to mention the other two books in the Witches of Galdorheim series. I think you can read Midnight Oil and be fully satisfied getting a complete adventure, BUT, if you find the book interesting, you can find Bad Spelling (already available) and Scotch Broom (coming next spring). The young witch, accompanied by her half-vampire brother, must travel to the Hall of the Mountain King and the farthest reaches of Siberia to regain her magic, dodging attacks by the shaman along the way. While dodging the goddess’s minions and trying to find her way out of the Otherworld, Kat soon learns she shouldn’t underestimate the old has-been for one second; the crone still has a few tricks that can drain a witch’s magic in a flash. To make matters worse, Kat’s brother secretly followed her into the Otherworld. Now he’s in danger, too. Kat has to go one on one with the goddess to save herself and her brother. I’ll be looking forward to the Stonehenge episode. I was just there a year and a half ago with my grandson and his cousin and this will bring back good memories. Thanks, Marva, for sharing the info about your books with me and my readers (who will not forget to leave their contact information for the drawing for a free book).